Outdoor entertaining in South Africa is defined by preparing and eating meals outside, making the most of pleasant weather and great company alongside the pool, amidst the beauty of a garden, in view of seascapes or simply in the fresh air. Therefore, it seems only natural for our traditional indoor kitchens to spill outdoors onto decks, patios, verandas or balconies. 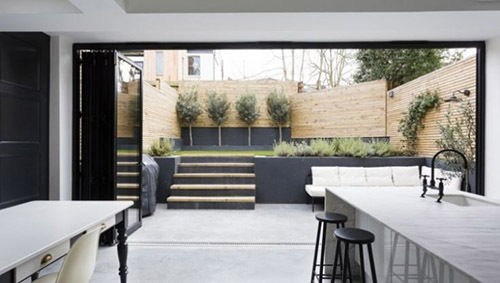 Whether it is simply having expansive doors leading off a kitchen to an intimate eating area or a fully-integrated indoor-outdoor kitchen with outside appliances, prep areas, storage and seating, there are some basic guidelines to follow to ensure successful connection of the inside and outside spaces. Follow the natural floorplan of the kitchen to allow for seamless flow between the indoor kitchen and the outdoor area. Where possible continue the lines and style of the kitchen in a way that adds to the indoor features and functions instead of duplicating them. Choose outdoor finishes – flooring, paint colour, materials and furniture – that complement the indoor décor to create a harmonious scheme. 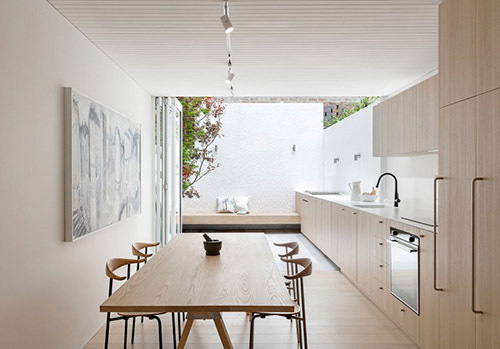 How successfully the interior and exterior spaces connect depends ironically on how they are separated. Large glass sliding doors or windows allow for visual connection even when closed, and concertina stacking doors allow for complete integration when open. Alternatively, create a feature entrance that is a feature in its own right. While outdoor cabinetry, countertops and appliances need to be practical, durable and weather-resistant, they also need to be stylish. 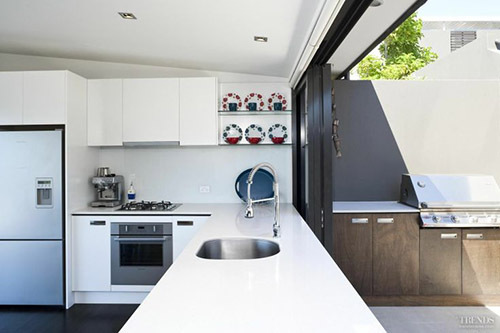 There is a large variety of materials that can be used outdoors, from stone to cement, granite to steel, marine polymer to certain woods such as teak, the choice of which should match indoor cabinet finishes and counter tops. Superior’s custom cabinetry can be finished to perfectly complement a wide range of natural materials. 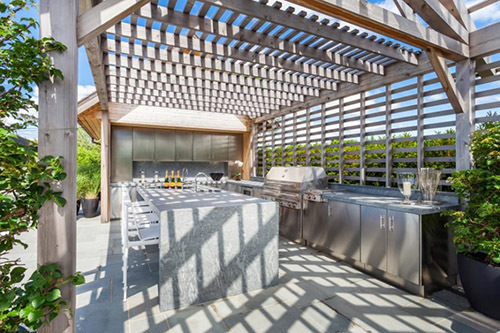 If space allows, creating a complete stand-alone outdoor kitchen is an investment that will not only reap financial rewards in terms of property value, but will add great value to the South African lifestyle. Be sure to protect from the elements with structurally sound roofing, and for optimum use, include versatile barriers from wind, rain and direct sun such as screens, awnings and shutters.